Beautiful tanto attributed to Tegai Kanetoshi. Very nice healthy piece with very strong utsuri. Kanetoshi was a representative smith from the famous Yamato Tegai School. Who worked around the mid 1400’s. He specialized in making tanto, and is rated wazamono (very sharp). This tanto is very healthy, the temper of nie deki suguha is very bright and has fine kinsuji running in the hamon. The jigane is a very beautiful o itame mokume mix with shirake utsuri.ji nie and chikei are present. 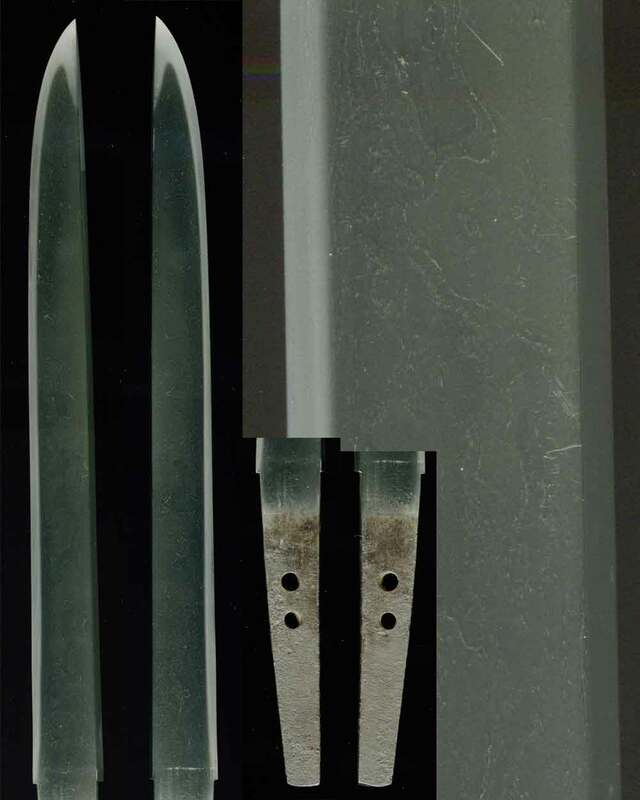 The blade is also very thick (7.6mm) and would qualify as a yoroi doshi. In very good polish and condition, this is a very nice piece for both study and enjoyment. The mountings are dashisame aikuchi style, with a beautiful ribbed scabbard done in black lacquer. The menuki are nice shakudo dragons with fine carving, they look like goto school work. The kozuka is a very nice dark shakudo plate with a dragoon done in kiribori signed (gichin?) Mei looks good and I believe he is a Mito kinko artist. Blade in shirasaya with a very well done gold foiled habaki, mounts on professional made tsunagi, NBTHK Hozon to Kanetoshi.